Jonno Turner bends the rules today to bring two away picks at cracking value - looking at action in Germany and Romania. We're off to Germany for our first pick of the week - and focusing on the second tier, as Dynamo Dresden host 1. 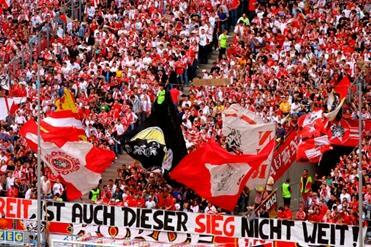 FC Koln at the Glucksgas Stadion. The hosts go into this game having won just two of their last five, and will be desperate to build some consistency with the end of the campaign in sight. Peter Pacult's side currently sit at the wrong end of the table, in 16th place, and a win would move them out of the dangerzone - and a 1-0 defeat of leaders Hertha BSC at the beginning of the month will have given the home side confidence - but they failed to build on that three points, losing 1-0 to Erzgebirge Aue last time out. Just one clean sheet from their last five games suggests that Dresden are likely to present their visitors with some chances, and, with Koln in lethal form of late, that could be a key factor in this game. Pacult will be without Savic, Papadopoulos and Guedea, and they will be big misses to his side in this game - with both sides desperate for the points. The away side sit fourth in the table, and will be keen to secure maximum points here in order to heap pressure on third placed Kaiserslautern - who are just four points ahead, having played a game more. Holger Stanislawski's charges go into this one unbeaten in the league since November - and that consistency has played a huge part in their rise up the division. And the Cologne side have not lost in six outings on the road - keeping four clean sheets in that time, which indicates that they are more than comfortable keeping things tight away from the RheinEnergieStadion. A 3-0 defeat of Paderborn last time out will have boosted confidence in the away camp, and I think that they will have too much for their hosts in this clash. Over to Romania now, as CFR Cluj line up against Rapid Bucuresti, with both sides looking for improvement following underwhelming campaigns. Cluj sit seventh in Liga I ahead of this clash, and have not won in five outings - scoring just one goal in that most recent seven and a half hours of football. Boss Paulo Sergio has seen his side win four, draw three and lose three at the Dr Constantin Radulescu Stadium, and that inconsistency threatens to seriously derail their season. And the home side are without key players Panteli Kapetanos and Ricardo Cadu ahead of this derby, who will be major absentees for the Transylvanians. Visitors Rapid Bucuresti sit one place behind their hosts, in eighth place, and will be desperate to close a four point margin with a win here. Marian Rada's side have lost just one of their last five on the road, and three clean sheets in that time shows just how comfortable the away side have looked of late. Rapid have won four of their last five against Cluj - and will be keen to maintain that positive record here - at cracking odds of 5.7. I expect a tight and balanced game, despite the odds suggesting otherwise.